On August 15, the DeKuyper(R) brand announced the bottling of its five millionth case of DeKuyper Pucker(R) Sour Apple, the neon green key ingredient in that “iconic” cocktail, the Appletini. Little did they know that to leading mixologists and cocktail aficionados , the Sour Apple Martini is officially dead. 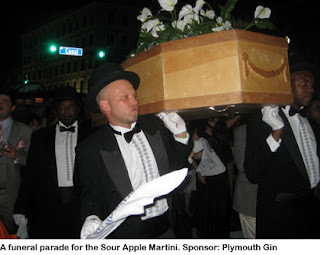 There was brilliant and uplifting music played in a classic jazz funeral style and a well-attended processional of the casket with Robert Hess in the vanguard…After the processional attendees were invited to enjoy drinks and scantily clad ladies in Cafe Giovanni where a “Bartender’s Breakfast” was held. Unfortunately, the talented ladies likely couldn’t be seen due to the number of celebrants trying to get a real, true, non-floor polish-infused, drink from the veteran and highly regarded bartenders. There was also dancing in the street; it was very Martha and the Vandellas. Complete coverage of the funeral event can be found here and here. DeKuper’s release can be read here. Now, why don’t you hunker down with a bottle of applejack and celebrate the great Sour Apple Martini debate with a drink? The blended stuff you’re most likely to find on local shelves is delicious in the following drink. If you have friends or family in Jersey, ask them to help you procure a bottle of Laird’s Old Apple Brandy, which it bills as the “original historic Applejack”, or the older still 12 Year Old Rare Apple Brandy (which you can read up on here.) My mother is traveling in the region as we speak, and was perfectly happy to be my mule. As we all know, a family that drinks together stays together. Shake with ice, strain into a cocktail glass, garnish with a lemon twist.